Asking just $10.00 Each -- MUST SELL -- Make me an Offer -- For 1 -- OR BOTH !! Buyer to pay U.S. Shipping, or items can be picked up. Cash or Money Order Only. 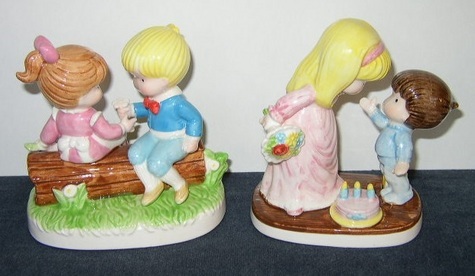 Sweet, 1983 Joan Walsh Anglund Figurines !!! Two (2) Different items to choose from. Made of Porcelain, each is marked on the bottom with it's "Title" & "Joan Walsh Anglund - Ebeling Reuss W. Germany. Both in Excellent Condition, No Chips, No Cracks ! Item #1: ...Thank You For Being You... Little Boy & Girl sitting on a Log, he's handing her a Flower, & she has another in her other hand; a Little Blue Bird is at her feet. Measures 4-1/2 inches. Item #2: ...Birthday Kiss... Little Girl leaning over to Kiss a Little Boy, she's holding a Bouquet of Flowers behind her back, & a Birthday Cake is on the floor between them. Measures 5 inches. See More JWA Collectibles & all my items posted for sale in my online store !